Caret Package is a comprehensive framework for building machine learning models in R. In this tutorial, I explain nearly all the core features of the caret package and walk you through the step-by-step process of building predictive models. Be it a decision tree or xgboost, caret helps to find the optimal model in the shortest possible time. Caret Package – A Practical Guide to Machine Learning in R. Photo by Kate Tryst. 3.1. How to split the dataset into training and validation? 3.3. How to impute missing values using preProcess()? 3.4. How to create One-Hot Encoding (dummy variables)? 3.5. How to preprocess to transform the data? 5. How to do feature selection using recursive feature elimination (`rfe`)? 6.1. How to `train()` the model and interpret the results? 6.2 How to compute variable importance? 7. How to do hyperparameter tuning to optimize the model for better performance? 8. How to evaluate the performance of multiple machine learning algorithms? 9.1. How to ensemble predictions from multiple models using caretEnsemble? Caret is short for Classification And REgression Training. It integrates all activities related to model development in a streamlined workflow. For nearly every major ML algorithm available in R.
With R having so many implementations of ML algorithms, it can be challenging to keep track of which algorithm resides in which package. Sometimes the syntax and the way to implement the algorithm differ across packages. This combined with data preprocessing, consulting help page, hyperparameter tuning to find best model can make building predictive models an involved task. Well, thanks to caret because no matter which package the algorithm resides, caret will remember that for you. It may just prompt you to run install.package for that particular algorithm’s package. Later in this tutorial I will show how to see all the available ML algorithms supported by caret (it’s a long list!) and what hyperparameters to tune. Plus also, we will not stop with the caret package but go a step ahead and see how to ensemble the predictions from many best models. We will use caretEnsemble for this and may be produce an even better prediction. Now that you have a fair idea of what caret is about, let’s get started with the basics. For this tutorial, I am going to use a modified version of the Orange Juice Data, originally made available in the ISLR package. The goal of this dataset is to predict which of the two brands of orange juices did the customers buy. The predictor variables are characteristics of the customer and the product itself. It contains 1070 rows with 18 columns. The response variable is ‘Purchase’ which takes either the value ‘CH'(citrus hill) or ‘MM'(minute maid). I have chosen a lightweight dataset so the focus is on getting familiar with the usage of caret package, instead of spending time on training models on large data. Let’s import the dataset and see it’s structure and starting few rows. The first step is to split it into training(80%) and test(20%) datasets using caret’s createDataPartition function. The advantage of using createDataPartition() over the traditional random sample() is, it preserves the proportion of the categories in Y variable, that can be disturbed if you sample randomly. Let me quickly refresh why are splitting the dataset into training and test data. The reason is when building models the algorithm should see only the training data to learn the relationship between X and Y. This learned information forms what is called a machine learning model. The model is then used to predict the Y in test data by looking only the X values of test data. Finally, the predicted values of Y is compared to the known Y from test dataset to evaluate how good the model really is. Alright, let’s create the training and test datasets. # Store X and Y for later use. createDataPartition() takes as input the Y variable in the source dataset and the percentage data that should go into training as the p argument. It returns the rownumbers that should form the training dataset. Plus, you need to set list=F, to prevent returning the result as a list. 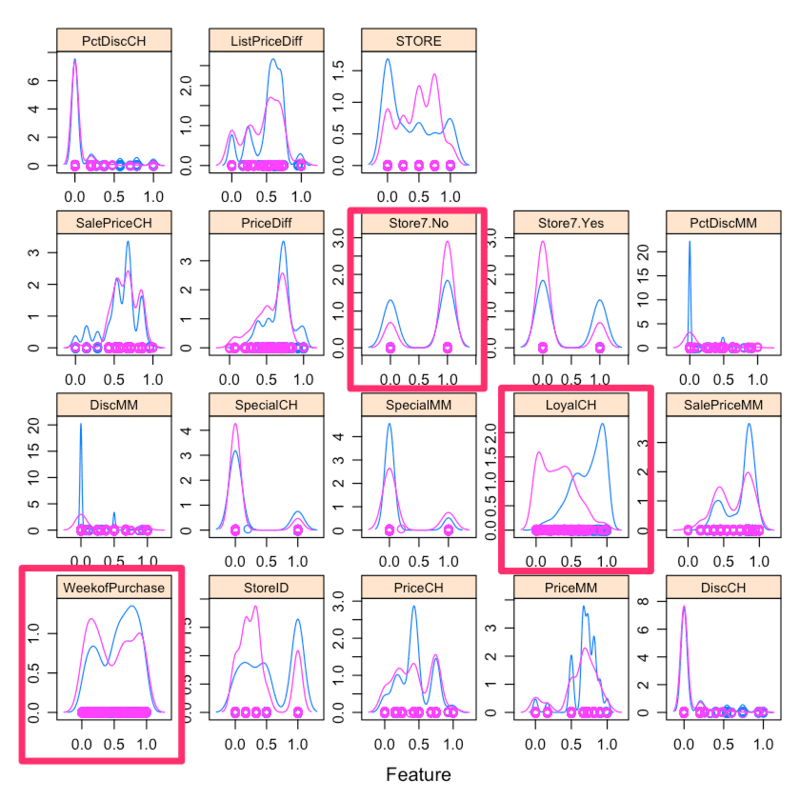 Before moving to missing value imputation and feature preprocessing, let’s observe the descriptive statistics of each column in the training dataset. The skimr package provides a nice solution to show key descriptive stats for each column. The skimr::skim_to_wide() produces a nice dataframe containing the descriptive stats of each of the columns. The dataframe output includes a nice histogram drawn without any plotting help. Notice the number of missing values for each feature, mean, median, proportion split of categories in the factor variables, percentiles and the histogram in the last column. We will examine how important each of these features is in predicting the response (Purchase) in section 4, once we are done with the data preprocessing. We’ve seen that the dataset has few missing values across all columns, we may to do well to impute it. Impute, means to fill it up with some meaningful values. If the feature is a continuous variable, it is a common practice to replace the missing values with the mean of the column. And if it’s a categorical variable, replace the missings with the most frequently occurring value, aka, the mode. But this is quite a basic and a rather rudimentary approach. Instead what can be done is, you can actually predict the missing values by considering the rest of the available variables as predictors. A popular algorithm to do imputation is the k-Nearest Neighbors. This can be quickly and easily be done using caret. Because, caret offers a nice convenient preProcess function that can predict missing values besides other preprocessing. You need to set the method=knnImpute for k-Nearest Neighbors and apply it on the training data. This creates a preprocess model. Then use predict() on the created preprocess model by setting the newdata argument on the same training data. Caret also provides bagImpute as an alternative imputation algorithm. The above output shows the various preprocessing steps done in the process of knn imputation. That is, it has centered (subtract by mean) 16 variables, ignored 2, used k=5 (considered 5 nearest neighbors) to predict the missing values and finally scaled (divide by standard deviation) 16 variables. Let’s now use this model to predict the missing values in trainData. All the missing values are successfully imputed. Let me first explain what is one-hot encoding and why it is required. Suppose if you have a categorical column as one of the features, it needs to be converted to numeric in order for it to be used by the machine learning algorithms. Just replacing the categories with a number may not be meaningful especially if there is no intrinsic ordering amongst the categories. So what you can do instead is to convert the categorical variable with as many binary (1 or 0) variables as there are categories. An important aspect you should be careful about here is, in real-world environments, you might get new values of categorical variables in the new scoring data. So, you should ensure the dummyVars model is built on the training data alone and that model is in turn used to create the dummy vars on the test data. In caret, one-hot-encodings can be created using dummyVars(). Just pass in all the features to dummyVars() as the training data and all the factor columns will automatically be converted to one-hot-encodings. # Creating dummy variables is converting a categorical variable to as many binary variables as here are categories. # Create the dummy variables using predict. The Y variable (Purchase) will not be present in trainData_mat. In above case, we had one categorical variable, Store7 with 2 categories. It was one-hot-encoded to produce two new columns – Store7.No and Store7.Yes. With the missing values handled and the factors one-hot-encoded, our training dataset is now ready to undergo variable transformations if required. So what type of preprocessing are available in caret? YeoJohnson: Like BoxCox, but works for negative values. expoTrans: Exponential transformation, works for negative values. For our problem, let’s convert all the numeric variables to range between 0 and 1, by setting method=range in preProcess(). All the predictor now range between 0 and 1. 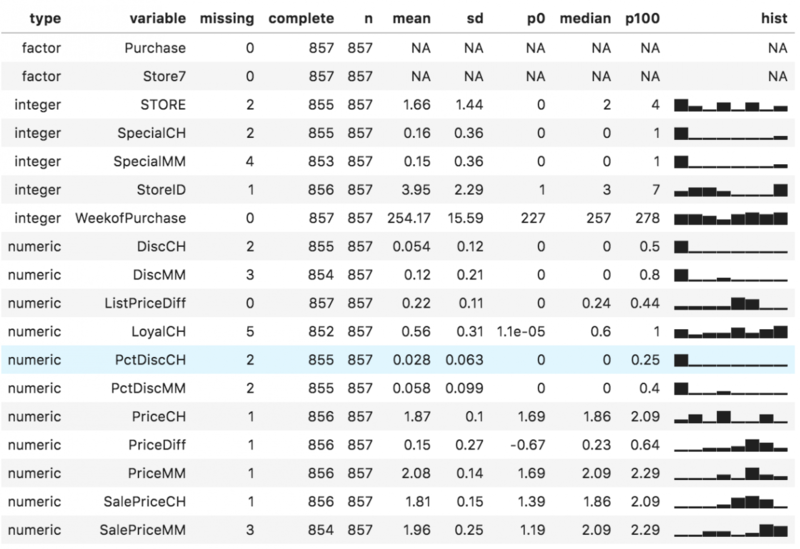 Now that the preprocessing is complete, let’s visually examine how the predictors influence the Y (Purchase). In this problem, the X variables are numeric whereas the Y is categorical. So how to gauge if a given X is an important predictor of Y? A simple common sense approach is, if you group the X variable by the categories of Y, a significant mean shift amongst the X’s groups is a strong indicator (if not the only indicator) that X will have a significant role to help predict Y. 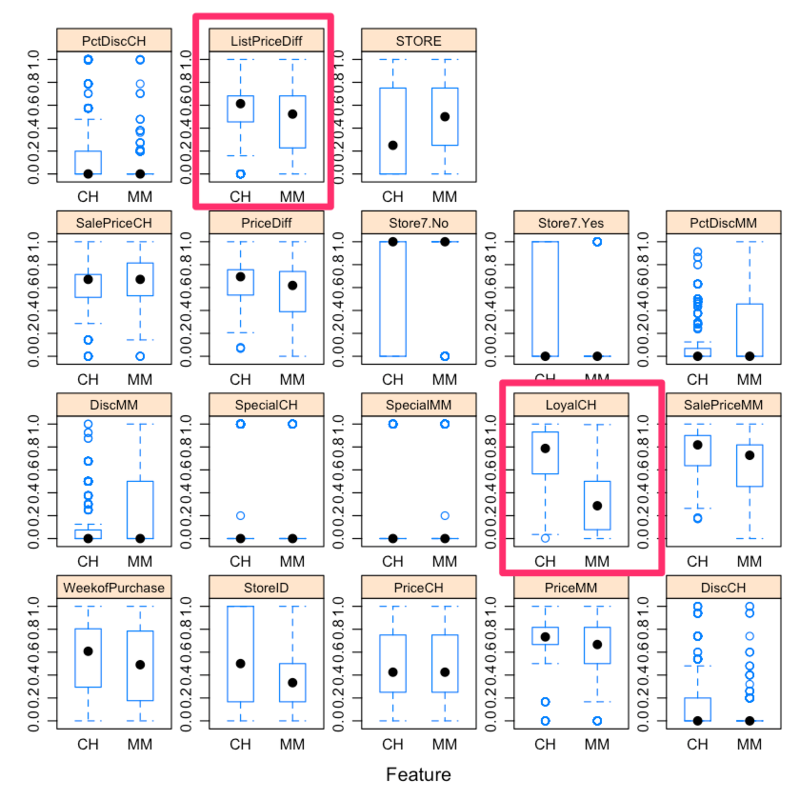 It is possible to watch this shift visually using box plots and density plots. In fact, caret’s featurePlot() function makes it so convenient. Simply set the X and Y parameters and set plot='box'. You can additionally adjust the label font size (using strip) and the scales to be free as I have done in the below plot. 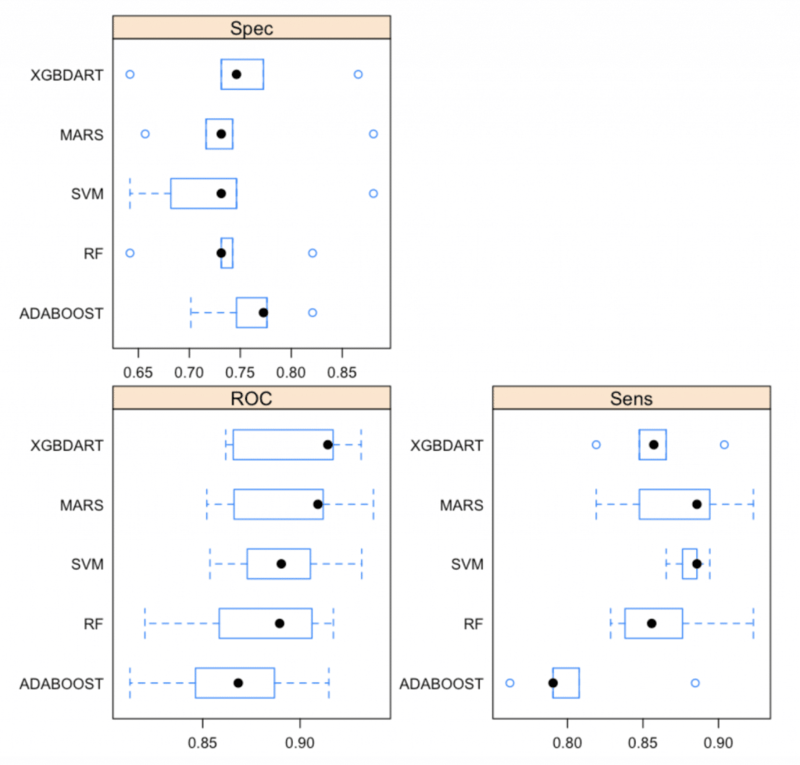 Let me quickly refresh how to interpret a boxplot. Each subplot in the above figure has two boxplots (in blue) inside it, one each for each of the Y categories, CH and MM. The top of the box represents the 25th %ile and the bottom of the box represents the 75th %ile. The black dot inside the box is the mean. The blue box represents the region where most of the regular data point lie. The subplots also show many blue dots lying outside the top and bottom dashed lines called whiskers. These dots are formally considered as extreme values. So, What did you observe in the above figure? Consider for example, LoyalCHs subplot, which measures the loyalty score of the customer to the CH brand. The mean and the placement of the two boxes are glaringly different. Just by seeing that, I am pretty sure, LoyalCH is going to be a significant predictor of Y. What other predictors do you notice have significant mean differences? Let’s do a similar exercise with density plots. In this case, For a variable to be important, I would expect the density curves to be significantly different for the 2 classes, both in terms of the height (kurtosis) and placement (skewness). Take a look at the density curves of the two categories for ‘LoyalCH’, ‘STORE’, ‘StoreID’, ‘WeekofPurchase’. Are they different? Having visualised the relationships between X and Y, We can only say which variables are likely to be important to predict Y. It may not be wise to conclude which variables are NOT important. Because sometimes, variables with uninteresting pattern can help explain certain aspects of Y that the visually important variables may not. So to be safe, let’s not arrive at conclusions about excluding variables prematurely. 5. How to do feature selection using recursive feature elimination (rfe)? Most machine learning algorithms are able to determine what features are important to predict the Y. 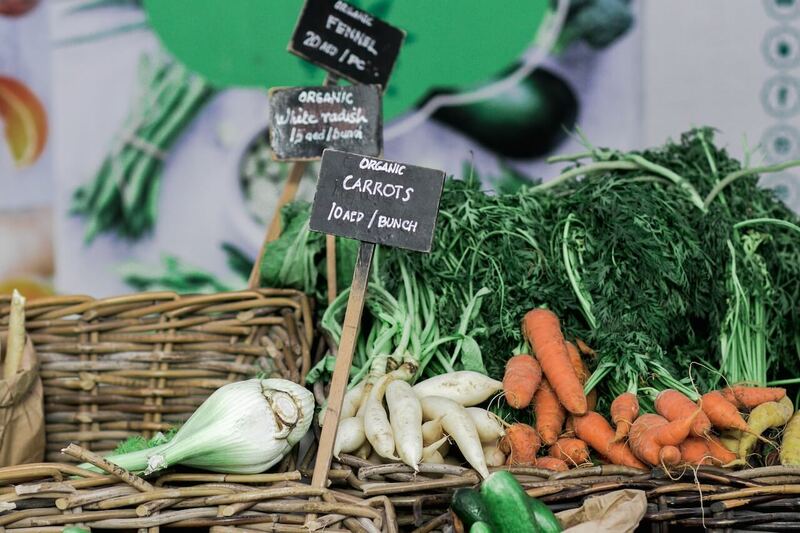 But in some scenarios, you might be need to be careful to include only variables that may be significantly important and makes strong business sense. This is quite common in banking, economics and financial institutions. Or you might just be doing an exploratory analysis to determine important predictors and report it as a metric in your analytics dashboard. Or if you are using a traditional algorithm like like linear or logistic regression, determining what variable to feed to the model is in the hands of the practitioner. Given such requirements, you might need a rigorous way to determine the important variables first before feeding them to the ML algorithm. A good choice of selecting the important features is the recursive feature elimination (RFE). So how does recursive feature elimination work? Step 1: Build a ML model on a training dataset and estimate the feature importances on the test dataset. Step 2: Keeping priority to the most important variables, iterate through by building models of given subset sizes, that is, subgroups of most important predictors determined from step 1. Ranking of the predictors is recalculated in each iteration. Step 3: The model performances are compared across different subset sizes to arrive at the optimal number and list of final predictors. It can be implemented using the rfe() function and you have the flexibility to control what algorithm rfe uses and how it cross validates by defining the rfeControl(). In the above code, we call the rfe() which implements the recursive feature elimination. Apart from the x and y datasets, RFE also takes two important parameters. The sizes determines what all model sizes (the number of most important features) the rfe should consider. In above case, it iterates models of size 1 to 5, 10, 15 and 18. The rfeControl parameter on the other hand receives the output of the rfeControl() as values. If you look at the call to rfeControl() we set what type of algorithm and what cross validation method should be used. In above case, the cross validation method is repeatedcv which implements k-Fold cross validation repeated 5 times, which is rigorous enough for our case. 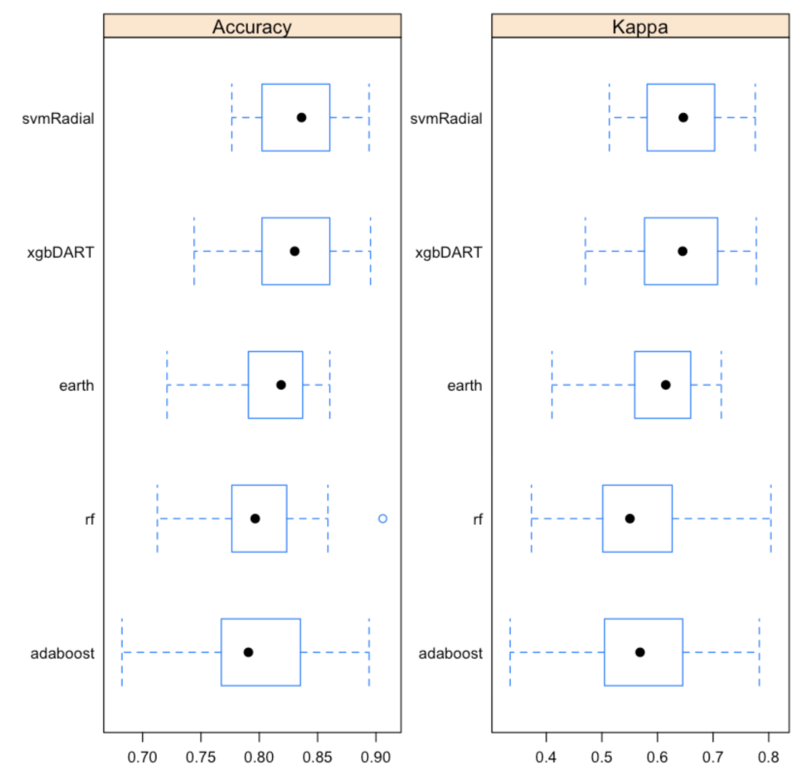 Once rfe() is run, the output shows the accuracy and kappa (and their standard deviation) for the different model sizes we provided. The final selected model subset size is marked with a * in the rightmost Selected column. From the above output, a model size of 3 with LoyalCH, PriceDiff and StoreID seems to achieve the optimal accuracy. That means, out of 18 other features, a model with just 3 features outperformed many other larger model. Interesting isn’t it! Can you explain why? However, it is not a mandate that only including these 3 variables will always give high accuracy over larger sized models. Since ML algorithms have their own way of learning the relationship between the x and y, it is not wise to neglect the other predictors, especially when there is evidence that there is information contained in rest of the variables to explain the relationship between x and y. Plus also, since the training dataset isn’t large enough, the other predictors may not have had the chance to show its worth. In the next step, we will build the actual randomForest model on trainData. 6.1. How to train() the model and interpret the results? Now comes the important stage where you actually build the machine learning model. Each of those is a machine learning algorithm caret supports. Yes, it’s a huge list! And if you want to know more details like the hyperparameters and if it can be used of regression or classification problem, then do a modelLookup(algo). Once you have chosen an algorithm, building the model is fairly easy using the train() function. 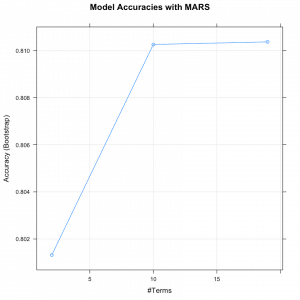 Let’s train a Multivariate Adaptive Regression Splines (MARS) model by setting the method='earth'. The MARS algorithm was named as ‘earth’ in R because of a possible trademark conflict with Salford Systems. May be a rumor. Or not. # Train the model using randomForest and predict on the training data itself. But you may ask how is using train() different from using the algorithm’s function directly? The train function also accepts the arguments used by the algorithm specified in the method argument. Now let’s see what the train() has generated. The final values used for the model were nprune = 19 and degree = 1. You can see what is the Accuracy and Kappa for various combinations of the hyper parameters – interaction.depth and n.trees. And it says ‘Resampling: Bootstrapped (25 reps)’ with a summary of sample sizes. Looks like train() has already done a basic cross validation and hyper parameter tuning. And that is the default behaviour. The chosen model and its parameters is reported in the last 2 lines of the output. 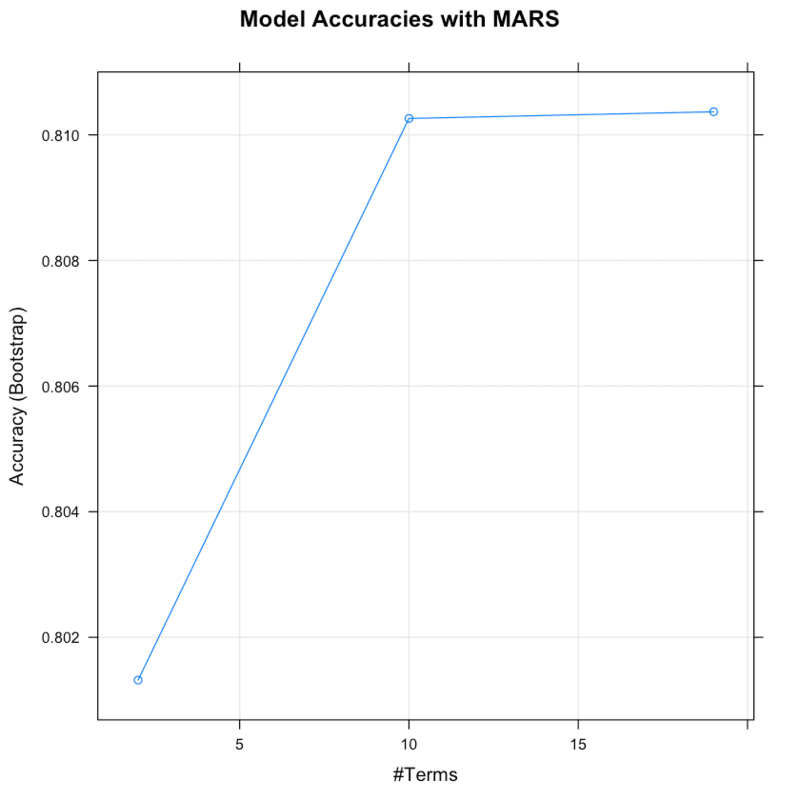 When we used model_mars to predict the Y, this final model was automatically used by predict() to compute the predictions. Plotting the model shows how the various iterations of hyperparameter search performed. 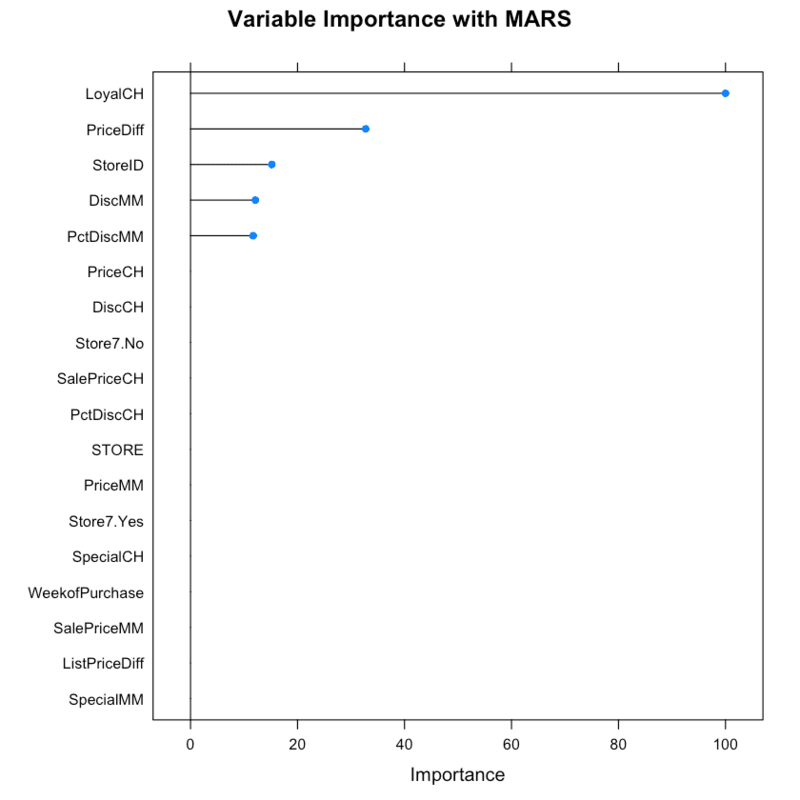 Excellent, since MARS supports computing variable importances, let’s extract the variable importances using varImp() to understand which variables came out to be useful. As suspected, LoyalCH was the most used variable, followed by PriceDiff and StoreID. A default MARS model has been selected. Now in order to use the model to predict on new data, the data has to be preprocessed and transformed just the way we did on the training data. Thanks to caret, all the information required for pre-processing is stored in the respective preProcess model and dummyVar model. The test dataset is prepared. Let’s predict the Y. The confusion matrix is a tabular representation to compare the predictions (data) vs the actuals (reference). By setting mode='everything' pretty much most classification evaluation metrics are computed. You have an overall accuracy of 80.28%. tuneLength corresponds to the number of unique values for the tuning parameters caret will consider while forming the hyper parameter combinations. Caret will automatically determine the values each parameter should take. Alternately, if you want to explicitly control what values should be considered for each parameter, then, you can define the tuneGrid and pass it to train(). Let’s see an example of both these approaches but first let’s setup the trainControl(). The train() function takes a trControl argument that accepts the output of trainControl(). Cross validation method to use. The summaryFunction can be twoClassSummary if Y is binary class or multiClassSummary if the Y has more than 2 categories. By settiung the classProbs=T the probability scores are generated instead of directly predicting the class based on a predetermined cutoff of 0.5. Let’s take the train() function we used before, plus, additionally set the tuneLength, trControl and metric. ROC was used to select the optimal model using the largest value. The final values used for the model were nprune = 6 and degree = 1. Alternately, you can set the tuneGrid instead of tuneLength. The final values used for the model were nprune = 4 and degree = 2. 8. How to evaluate performance of multiple machine learning algorithms? Caret provides the resamples() function where you can provide multiple machine learning models and collectively evaluate them. Let’s first train some more algorithms. The final values used for the model were nIter = 50 and method = Adaboost.M1. The final value used for the model was mtry = 6. 0.5, skip_drop = 0.05 and min_child_weight = 1. The final values used for the model were sigma = 0.06414448 and C = 0.5. Let’s plot the resamples summary output. In the above output you can see clearly how the algorithms performed in terms of ROC, Specificity and Sensitivity and how consistent has it been. The xgbDART model appears to be the be best performing model overall because of the high ROC. 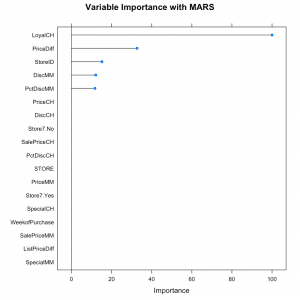 But if you need a model that predicts the positives better, you might want to consider MARS, given its high sensitivity. Either way, you can now make an informed decision on which model to pick. The caretEnsemble package lets you do just that. All you have to do is put the names of all the algorithms you want to run in a vector and pass it to caretEnsemble::caretList() instead of caret::train(). # Stacking Algorithms - Run multiple algos in one call. Plot the resamples output to compare the models. Excellent! It is possible for further tune the model within caretList in a customised way. That one function simplified a whole lot of work in one line of code. Here is another thought: Is it possible to combine these predicted values from multiple models somehow and make a new ensemble that predicts better? Turns out this can be done too, using the caretStack(). You just need to make sure you don’t use the same trainControl you used to build the models. A point to consider: The ensembles tend to perform better if the predictions are less correlated with each other. So you may want to try passing different types of models, both high and low performing rather than just stick to passing high accuracy models to the caretStack. 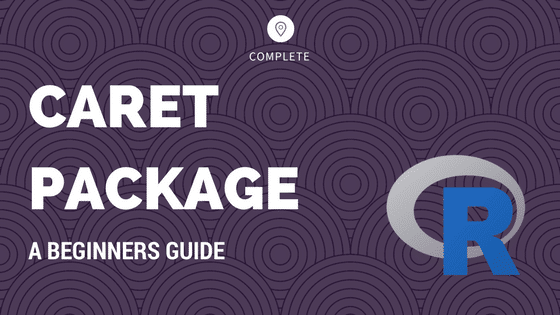 The purpose of this post was to cover the core pieces of the caret package and how you can effectively use it to build machine learning models. This information should serve as a reference and also as a template you can use to build a standardised machine learning workflow, so you can develop it further from there.